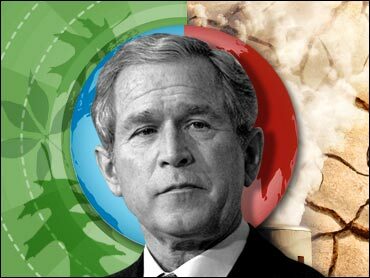 The Bush administration on Friday rejected regulating greenhouse gases blamed for global warming, saying it would cause too many job losses. In a 588-page federal notice, the Environmental Protection Agency made no finding on whether global warming poses a threat to people's health, reversing an earlier conclusion at the insistence of the White House and officially kicking any decision on a solution to the next president and Congress. The White House on Thursday rejected EPA's conclusion three weeks earlier that the 1970 Clean Air Act "can be both workable and effective for addressing global climate change." Instead, EPA said Friday that law is "ill-suited" for dealing with climate change. This contrasts sharply with the tone of statements President Bush made at the just-concluded G-8 summit of leading industrialized nations in Toyako, Japan. The United States at that meeting joined other summit partners in embracing a policy declaration to seek a 50 percent reduction in global greenhouse gases by 2050. In a major setback to the administration, the Supreme Court ruled last year that the government has authority under the Clean Act to regulate greenhouse gases as a pollutant. Bush has consistently opposed that option. Supporters of regulating greenhouse gases could get only 38 votes in the 100-member Senate last month. The House has held several hearings on the problem but no votes on any bill addressing it. The two major presidential candidates, Republican John McCain and Democrat Barack Obama, have endorsed variations of the approach rejected by the Senate. In its voluminous document, the EPA laid out a buffet of options on how to reduce greenhouse gases from cars, ships, trains, power plants, factories and refineries. "One point is clear: the potential regulation of greenhouse gases under any portion of the Clean Air Act could result in unprecedented expansion of EPA authority that would have a profound effect on virtually every sector of the economy and touch every household in the land," EPA Administrator Stephen Johnson said in a preface to the 588-page federal notice Friday. EPA said that it encountered resistance from the Agriculture, Commerce, Energy and Transportation departments, as well as the White House, that made it "impossible" to respond in a timely fashion to the Supreme Court decision. "Our agencies have serious concerns with this suggestion because it does not fairly recognize the enormous - and, we believe, insurmountable - burdens, difficulties, and costs, and likely limited benefits, of using the Clean Air Act" to regulate greenhouse gas emissions, the secretaries of the four agencies wrote to the White House July 9. Friday's action caps months of often tense negotiations between EPA scientists and the White House over how to address global warming under the major federal air pollution law. The document released Friday is much more cautious than a determination made in December by the agency that found greenhouse gases endangered health and welfare, and it also appears to reverse findings of drafts released in May and June that found the Clean Air Act could be an effective tool for reducing greenhouse gases. "EPA's approach to this has been completely thrown out by the White House, which is only attempting to stall any kind of clean up," said Frank O'Donnell," president of Clean Air Watch, an environmental advocacy group. "It sounds like the Bush administration is trying to ignore the Supreme Court and to pretend it doesn't exist." Rep. Edward Markey, chairman of the House Select Committee on Global Warming, called the administration's findings "the bureaucratic equivalent of saying that the dog ate your homework." "The White House has taken an earnest attempt by their own climate experts to respond to the Supreme Court's mandate to address global warming pollution and turned it into a Frankenstein's monster," said Markey, D-Mass. However, representatives of industry still expressed concern Friday over some of the suggestions included in the document. "Our point on this is that EPA has set forth a road map which literally throws the entire way which we manage the environment and economy in complete turmoil," said Bill Kovacs, vice president of the Environment, Technology and Regulatory Affairs Division at the U.S. Chamber of Commerce, who had not seen the version released Friday. "When we saw the first draft it clearly said we could make it work," Kovacs said. "We want them to say it is clearly the inefficient way to go."